The "nowcasting" portion of the seminar was very unique! It was like a case study, but allowing the person who is taking the module a look at conditions and model runs that actually happened. It was a very good tool and guide to make sure that people are looking at the right areas, looking for the right things, and doing so in a way that will stick in the brain. * Recognize the key synoptic ingredients that can lead to the development of an Alberta Clipper. 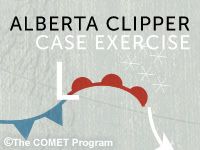 * Determine the track of an Alberta Clipper * Assess snowfall amounts associated with a clipper. * Identify signals in the satellite and radar imagery as well as in the NWP data that can be associated with these systems.